What Is The Future Of CNG? CNG is a form of natural gas known as compressed natural gas. Natural gas is a fossil fuel that is extracted from underground reservoirs. It consists mainly of methane, with small amounts of other hydrocarbons such as ethan, propane, and butane, and inert gases such as carbon dioxide, nitrogen, and helium. Natural gas drilling in the United States suffered an extreme depression in price around 2009. The price at the Henry Hub dropped to less than half price from its 2007 highs. In 2009, large companies were shutting in their natural gas wells and suspending any further drilling operations. During the natural gas mania phase of the mid to late 2000s, directional drilling and hydraulic fracking were combined with great success. This same principle is now being applied to tar sands and oil shale exploration. The actual composition of the gas varies, depending on its source. To be employed as a vehicle fuel, natural gas can be used either in its compressed form or in its liquid form (liquified natural gas). The same characteristic that makes compressed natural gas practical for fleet and delivery vehicles hinders its widespread use in most passenger cars: a tank can only hold enough fuel for approximately 100 miles, even though the gas tank is larger than a conventional tank. Until filling stations are much more widespread, the distance restriction creates a severe limitation to this fuel's development. The fundamental difference between compressed natural gas and conventional motor fuels is its form: it is gaseous rather than liquid. Most gasoline-powered vehicles can be converted to a dual-fuel engine with a simple process that does not require the removal of any of the original equipment. Natural gas cylinders are mounted on the rear of the vehicle, and a fuel line runs the gas from the cylinder to the engine through special mixer equipment. A switch installed in the dash selects either gasoline or natural gas operation. Diesel vehicles can also be converted to a dual-fuel configuration. As of this writing in 2013, there are 566 CNG filling stations in the United States. To locate a filling station, click here. Of course, it doesn't have to be purchased at a refilling station - there is an option to refuel at home. However, there are several drawbacks. 1. Filling up at a refueling station only takes about twice as long as refueling with diesel or gasoline. Refueling at home takes all night. The reason is that home refueling stations are under very low pressure while refueling stations are already pressurized. 2. Cost of the refueling station - a home refueling station can cost upwards of $5,000 for the unit and installation. 3. Depending on the location, installation of the refueling unit may require a building permit. The combination of directional drilling technology and fracking has greatly improved the in-gathering efforts of natural gas. Even though the United States is one of the largest natural gas producers, very little is used in the transportation sector. Problems with air quality and the large reserves of natural gas in this country have caused an increased in CNG as an automotive fuel recently. In 2011, there were 14.8 million natural gas vehicles worldwide. The largest consumers were: Iran, Pakistan, Argentina, Brazil, and India. In the United States, around 112,000 vehicles, including school buses, delivery trucks, and fleet vehicles, use natural gas as a fuel source. It emits at least 40 percent less hydrocarbons and 30 percent less carbon dioxide per mile than gasoline. It is also currently quite inexpensive as compared to gasoline. Maintenance costs can also be less than those for gasoline automobiles because CNG causes less corrosion and engine wear. The primary disadvantage is that it is a fossil fuel and it is a nonrenewable resource. Another drawback may be that fracking is used in the retrieval process and it's consequences have not been adequately studied. Another drawback is the range limitation. With 100 miles or maybe a little more per tank, refueling is a real problem. The weight and bulk of the CNG cylinders also take away storage space and reduce performance and fuel economy. 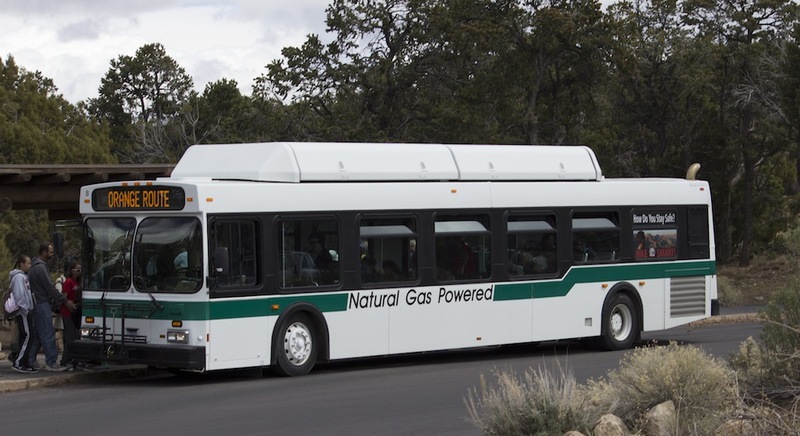 So, what does the future hold for compressed natural gas? Most likely, this area of nonrenewable energy will be further studied and refined. In the future, we expect to see compressed natural gas refueling stations everywhere.